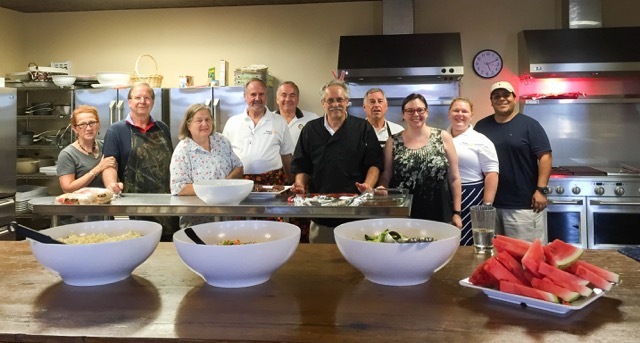 On October 22, 2016, another great dinner was prepared by Rotarians and their guests for Boulder Crest Retreat. Settled in the beautiful rural setting of Bluemont, VA, Boulder Crest Retreat is the nation's first privately-funded rural wellness center dedicated exclusively to combat veterans and their families. On a recurring basis, the Rotary Club of Leesburg prepares the meal, serves, visits and cleans up. Our next service date at the Retreat is January 6th, 2017. Pictured here is Mary Lou Whisler, Cherie John Whisler, Steve Krisa, Chuck Reavis, Ernie Carnevalle, Ron Rogos, Valerie Beaudoin, Peter Llanos, Rachel Llanos, Peter Llanos.